Your choice between our traditional event distances of Big Lizard 10 Mile, 8 Kilometers, or a one-lap tour of 4 Kilometers. New for 2016... our Terathlon 8-Hour option for ultra-trail runners with a 7:30 am starting time. Space for 150 eager runners... permit restrictions limit race participation to the first 150 registrants, which is a total combined count of participants within all events. Terrific moisture-wicking tech shirts for all registered runners and volunteers. 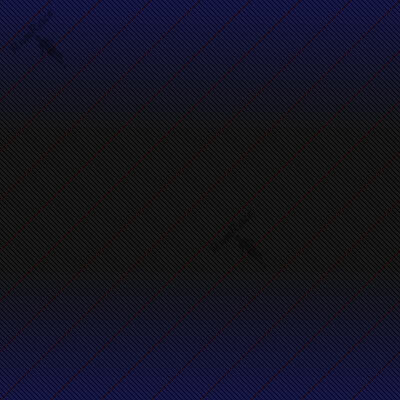 Chip timing & scoring with instant results published, here on RunRace.net for all participants. Awards in all events for top male & female finishers. Custom year-specific finisher pins for all participants who complete their event distance. Registration opens on June 21st 2016, and lasts through 6:00 pm on Friday the day before race day, here on our RunRace Network. Due to permit restrictions we cannot offer race-day registration. Note: Note: Ample parking is available at Linne Woods grove, which is on the north side of Dempster St. For safety, we recommend that you approach Linne Woods grove while traveling a westerly direction on Dempster Street, then make a right turn into the parking lot. 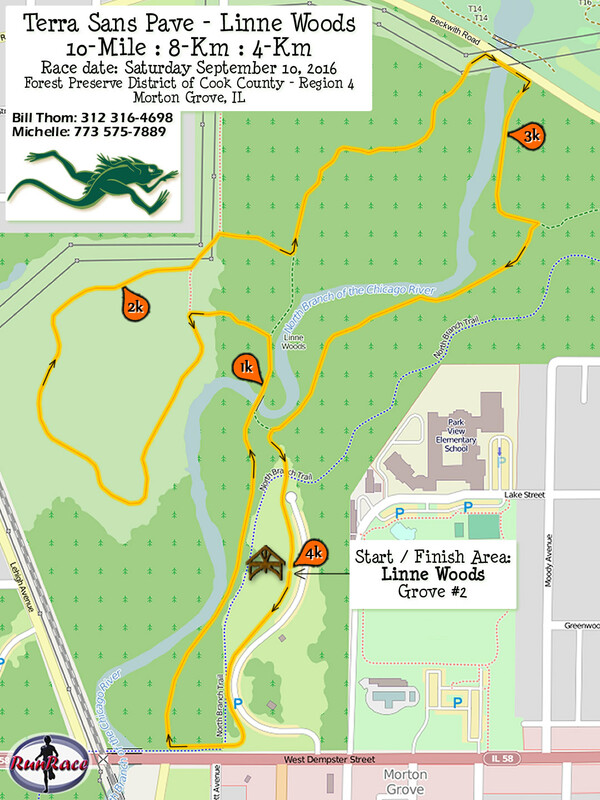 Our 2016 Terra Sans Pave - Linne Woods trail runs takes place entirely within Region 4: North Cook County, nearby the North Branch Trail system of the Forest Preserve District of Cook County, in Morton Grove. Linne Woods, Grove #2 pavilion serves as race start / finish area and our aid station. Terra Sans Pave is ideal for first-time trail runners, and those experienced runners looking to post a fast time for "not too technical" trail racing. A variety of surfaces make up the racecourse for Terra Sans Pave... crushed gravel, dirt and wood-chip paths comprise about 90% of the course, with sections traversing grassy fields. You'll cross two bridges on each lap, and even run along the river bank. There are no man-made obstacles, nor river crossings but conditions may be muddy especially with rainy weather in the week leading up to race day. Expect mostly smooth non-technical running, with occasional rocks & roots, and small slightly rolling hills. Each lap is 4 kilometers (~2½ miles) in length. Terra Sans Pave Trail Runs has been granted permission to add an eight-hour ultra to its existing event distances. We're pleased to announce this new event, Terathlon 8-Hour, with its starting time of 7:30 am. Participants of "Terathlon" will cover as many laps of our Terra Sans Pave trail-racecourse as they're able within eight hours, from 7:30 am, until 3:30 pm. Laps will be counted and mileage calculated using chip timing. Top runners will be determined by most mileage accumulated. Participants who accumulate more than 26.2 miles will earn special Terathlon ultra awards. Our Terra Sans Pave - Linne Woods race is a USA Track & Field sanctioned event. You may visit the USATF website by clicking either logo image.